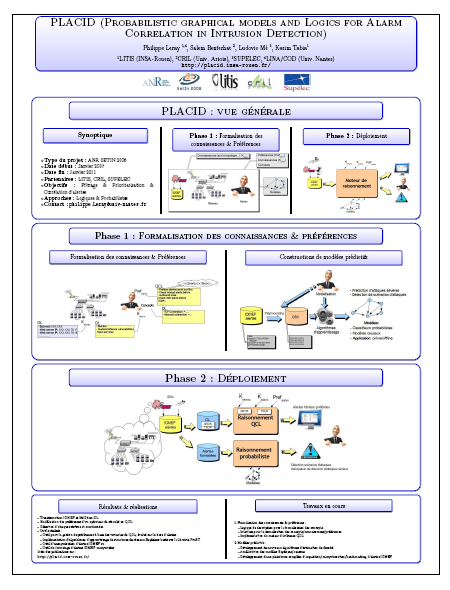 PLACID is a scientific project funded by the ANR, within SETIN 2006 computer science and security call for project and closed in december 2010. LITIS (Laboratoire d’Informatique, Traitement de l’Information et des Systèmes) lab, Institut National des Sciences Appliquées (INSA) de Rouen / Universités de Rouen et du Havre. People and organizations increasingly rely on networks and computer systems, whose complexity is growing fast, thus bringing new social, economic, strategic threats which are actively exploited by individuals with various objectives. Intrusion detection is a field of computer security whose goal is to monitor the activity of an information system for the occurrence of malicious activities, i.e. actions intended to violate the security policy governing confidentiality, integrity and availability of services and data. Intrusion detection has been a very active research area for the past few years, and several complementary solutions have been proposed to protect networks against attacks of all forms and origins. Despite these efforts, intrusion detection systems (IDS) still suffer from several drawbacks. Firstly, IDS trigger too many alerts, a large proportion of which turn out to be false positives. Security operators are consequently overwhelmed with alerts, the analysis of which is time consuming and incompatible with the alert rate. Secondly, the detection is still incomplete, that is to say attacks are still missed by IDS (also known as false negatives). Improving the detection rate requires the multiplication of heterogeneous sensors, so as to enhance the monitoring coverage and benefit from complementary detection techniques. However, multiplying sensors also multiplies the number of alerts received by security operators. Alarm correlation is a subfield of intrusion detection, whose goal is to make heterogeneous IDS sensors cooperate, in order to improve the attack detection rate, enrich the semantics of alerts and reduce the overall number of alerts. Several solutions have been proposed in the literature, all of which require knowledge about the attacks and the context in which they occur. At the same time, complementary tools have appeared to support alarm correlation by providing knowledge databases about attacks, as well as local and global contextual observations. However, none of these correlation solutions received a wide acceptance. We believe that one of the reason for this is that the intrusion detection domain lacks a common logic that would allow security systems to reason about complementary evidences and security operators to interact with these systems efficiently. A formal description logic for intrusion detection, called IDDL, which stands for Intrusion Detection Description Logic. IDDL will provide security components with a formal framework to characterize their observation, share their knowledge with third-party components and reason about complementary evidence information. Bayesian-based approaches for alert correlation. Our aim is to model uncertainty associated with alerts, to represent malicious actions, and to model correlation relations between alerts. The use of bayesian networks has several advantages such that evaluating the success of attacks, reducing the set of possible attacks scenarios, learning correlation relations, or finding the root cause of alerts. Software component for alerts correlation. This project will include the development of software implementing bayesian-based correlation approach and IDDL reasoning tools, integrated in a global solution for alert handling. S. Benferhat and K. Sedki. 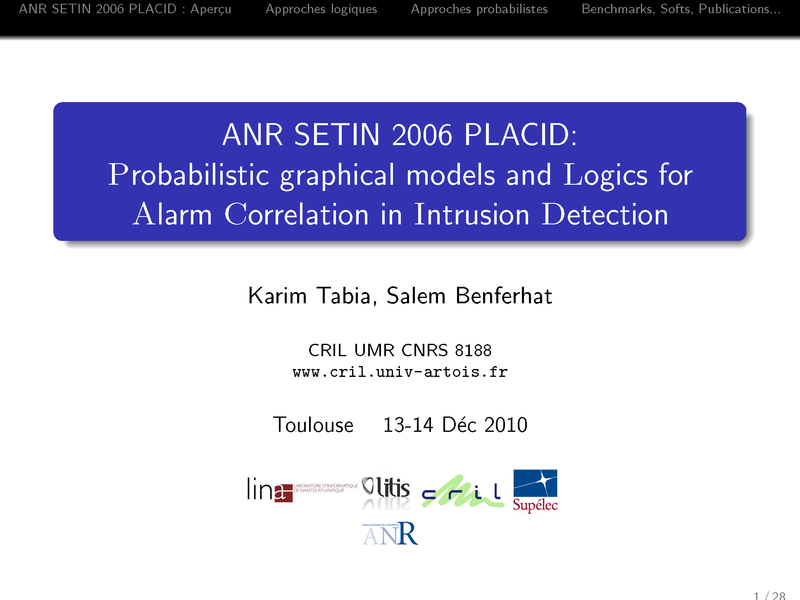 An alert correlation approach based on knowledge and preferences of security operator,dans Journal of Applied Non-Classical Logics (JANCL), 2010, pp. pp.7-37. S. Benferhat and K. Tabia, An efficient algorithm for naive possibilistic classifiers with uncertain inputs, dans International Journal of Intelligent systems (IJIS), vol. 24, n° 12, Wiley, pp. 1203 - 1229, décembre 2009. S. Benferhat and K. Sedki A preference logic-based approach for alert correlation. dans Logics in Security 2010, Copenhague. L. Bouzar-Benlabiod, S. Benferhat and T. Boubana-Tebibel, Integrating security operator knowledge and preferences to the alert correlation process. In International IEEE Conference on Machine and Web Intelligence – ICMW2010- Algiers, 2010, pp. 416 – 420. S. Benferhat and K. Tabia: Belief Revision of Product-Based Causal Possibilistic Networks. Canadian Conference on AI 2010: 244-255, Springer. K. Tabia. and P. Leray. Bayesian network-based approaches for severe attack prediction and handling idss' reliability. In Proceedings of the International Conference on Information Processing and Management of Uncertainty in Knowledge-Based Systems (IPMU 2010), pages 632-642, Dortmund, Germany. K. Tabia. and P. Leray. Handling idss' reliability in alert correlation: A bayesian network-based model for handling ids's reliability and controlling prediction/false alarm rate tradeoffs. In Proceedings of the International Conference on Security and Cryptography (SECRYPT'2010), pages ??-? ?, Athens, Greece. S. Benferhat and S. Yahi. Complexity and Cautiousness Results for Reasoning from Partially Preordered Belief Bases.In Proceedings of the 10th European Conference on Symbolic and Quantitative Approaches to Reasoning with Uncertainty (ECSQARU 2009), pages 817-828, Verona, Italy. S. Benferhat and K. Sedki. Two alternatives for handling preferences in qualitative choice logic. Fuzzy Sets and Systems (FSS’08), vol. 159, no 15, pp. 1889-1912, août 2008. S. Benferhat and K. Sedki. Alert correlation based on a logical handling of administrator preferences and knowledge. In Proceedings of International Conference on Security and Cryptography SECRYPT 08, Porto, Portugal. S. Benferhat, T. Kenaza and A. Mokhtari. A Naive Bayes approach for detecting coordinated attacks. 3rd IEEE International Workshop COMPSAC on Security, Trust, and Privacy for Software Applications (STPSA 2008), Juillet 2008. S. Benferhat and K. Sedki: A Revised Qualitative Choice Logic for Handling Prioritized Preferences. In Ninth European Conference on Symbolic and Quantitative Approaches to Reasoning with Uncertainty ECSQARU 2007, pages 635-647. S. Yahi, S. Benferhat and T. Kenaza: Conflicts Handling in Cooperative Intrusion Detection: A Description Logic Approach. 22nd IEEE International Conference on Tools with Artificial Intelligence, ICTAI 2010, Arras, pp 360-362, 2010. S. Yahi, T. Kenaza and S. Benferhat, De l’utilisation des logiques de description à la gestion des incohérences en détection d’intrusion coopérative. Dans la revue de Génie Logiciel, Volume 94, pp. (sélection de INFORSID'10), 2010. K. Tabia, P. Leray and L. Mé. From redundant/irrelevant alert elimination to handling idss' reliability and controlling severe attack prediction/false alarm rate tradeoffs. In Proceedings of the Fifth Conference on Network and Information Systems Security (SAR/SSI 2010), pages ??-? ?, Rocquebrune Cap-Martin, France. S. Yahi, S. Benferhat and T. Kenaza De l’utilisation des logiques de description à la gestion d’incohérences en détection d’intrusion coopérative. workshop SEC-SY (Sécurité des Systèmes d’Information et les Environnements Collaboratifs), Marseille, 2009. S. Benferhat and T. Kenaza, Vers une évaluation globale des classifieurs Bayésiens pour la détection d'intrusions, in 4èmes Journées Francophones sur les Réseaux Bayésiens (JFRB10), mai 2010, Nantes. Colloque Quelle Recherche pour les STIC de demain ? 5-7 janvier 2010, Paris. T. Kenaza, modèles graphiques probabilistes pour la corrélation d’alertes en détection d'intrusions. Thèse de l'Université d'Artois et de l'Université des Sciences et de la Technologie Houari Boumediene (Algérie), soutenance prévue début 2011. K. Sedki Raisonnement sous incertitude et en présence des préférences : Application à la détection d’intrusions et à la corrélation d’alerte. Thèse de l’Université d’Artois, décembre 2008.